Tecno Q1 is an entry level Android dual-SIM smartphone for consumers on budget. 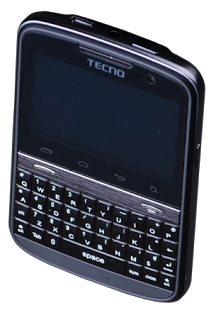 This smartphone features a physical QWERTY keyboard that makes sharing and posting easy and fast. Tecno Q1 andriod phone features Android 4.0 (Ice Cream Sandwich) and comes with Whatsapp messaging app pre-loaded. The Tecno Q1 also features a 1GHz dual-core processor with 512MB RAM, which will offer a decent performance considering the price. The device is loaded with Ice Cream Sandwich, which is great considering that the older Gingerbread appears to be the standard for most Android phones in its price point. Tecno Q1 mobile phone comes pre-loaded with Facebook, Whatsapp, GMail with over 600,000 apps available for download at the Google Play Store. Tecno Q1 features a 2.6-inch capacitive touch display with 480 x 320 pixels resolution. It also features a physical QWERTY keyboard. Tecno Q1 has a rear 5 megapixels camera with flash and a 0.3 megapixels front facing camera. 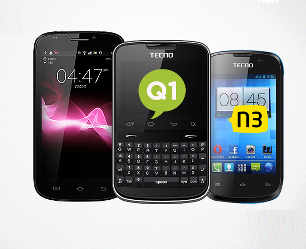 Where to Buy Tecno Q1 in Nigeria and price of Tecno Q1 in Nigeria ranges from N16,000 to N19,000. HVGA LCD with 256,000 colors.